My friend Kathy gave me this recipe many years ago when we lived in Tokyo. We often exchanged recipes back then as both of us were developing a passion for cooking. My children like this salad because they love to help fry and eat the rice sticks, an essential part of the salad. They can be made the day before serving to cut down on prep time. (Fried rice sticks make a nice alternative snack to potato chips or popcorn for children.) You can use poached, grilled, or roasted chicken for this recipe. I usually serve the salad with the dressing on the side so people can use the amount that suits them. Leftover undressed salad keeps well overnight in the refrigerator. Begin by heating 1-1/2 cups of oil in a 1-quart saucepan on medium heat. While the oil is heating, break the rice sticks into 1-1/2-inch long pieces. Test oil temperature by taking a piece of rice stick and placing it in the oil. If it puffs up and curls immediately, the oil is hot enough; if the rice stick sits on the bottom of the pot without puffing up, the oil needs to be hotter. Place a paper towel-lined deep bowl near the stove and have a fine mesh spider skimmer on hand to quickly remove the fried rice sticks once they puff up. Once the oil is hot enough take a small handful of rice sticks and place them in the hot oil. Immediately smash them down in the oil with the skimmer so the rice sticks are completely submerged in hot oil and within 5 seconds they will puff up and curl. Quickly remove them using the skimmer. Don’t let them brown, since they should be white or very light golden. Hold the skimmer over the pot to let the oil drain off the rice sticks. Place the hot rice sticks in the paper towel-lined bowl. Sprinkle the puffed rice sticks with some fine salt. Repeat, adding rice sticks to the hot oil to puff and strain, until you use up all the rice sticks. Salt each batch of puffed rice sticks while they are still hot. Once the rice sticks cool, they can be stored in a gallon-size ziplock bag until ready to use. You may not need all the fried rice sticks for the salad. Use extra for snacking. 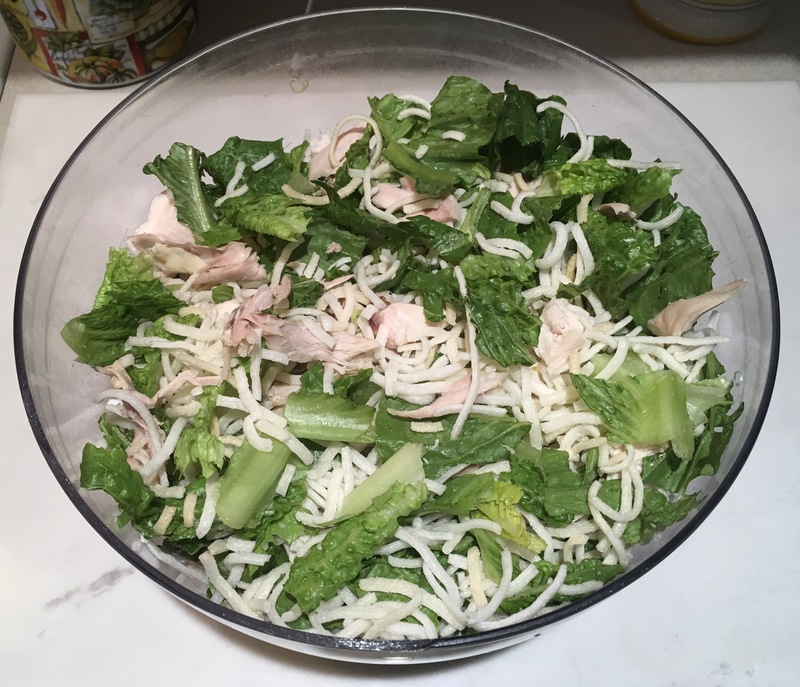 Place chicken, lettuce, and green onions in a large salad bowl. Season with salt and pepper to taste. Add handfuls of puffed rice sticks until you have as much as you want in the salad. We like a lot of rice noodles. Toss. Mix up the salad dressing and serve on the side. Serves 4-6. Place all ingredients in a 2-cup mason jar. Screw on lid and shake until the sugar has dissolved. Store in the refrigerator until ready to serve. Makes 2 cups. This entry was posted in Chicken, Salads. Bookmark the permalink. Thanks, Judy! We’ll have this for supper today!